What do cockroaches, power tools, and pollinator gardens have in common? 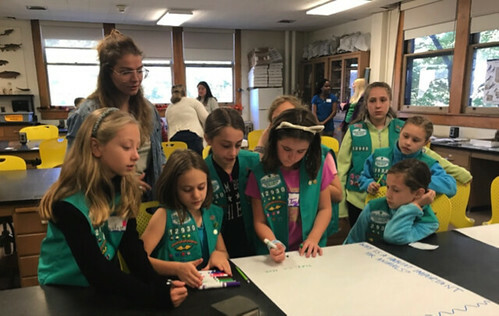 This fall, TLS teamed up with local Girl Scout troops to learn about the importance of animal habitats. Here is what happened! This post was co-authored by Heather Bisbee and Mercedes Harris. Here at TLS, one of our goals is to share the scientific world we hold so near and dear with those around us. 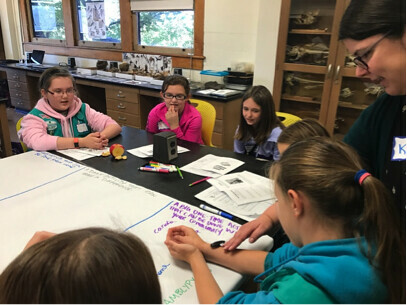 We therefore jumped at the chance to help local Girl Scout troops become junior experts in wild animals and the habitats they call home. As we prepared for our day full of cockroaches, power tools, and pollinator gardens, a swirl of excited murmurs and little green vests made its way towards us. We had a lot to accomplish in three hours—learning about endangered habitats and unsuspecting organisms, doing a scavenger hunt, and building a new animal home. As the Girl Scout motto tells us: be prepared and do a good turn daily, so what better team to tackle these topics than TLS graduate students and Girl Scouts ! After discussing some endangered habitats such as the Arctic and the Amazon Rainforest, we asked the Girl Scouts why they think a habitat is important for animals. The Scouts came up with many responses, both practical as well as touching reminders that the earth’s creatures may have more in common with us than we sometimes think: “They need food, shelter, somewhere to rest, they need each other”. The day continued through three stations: building a bird nest-box, kicking it with cockroaches, and a garden scavenger hunt. 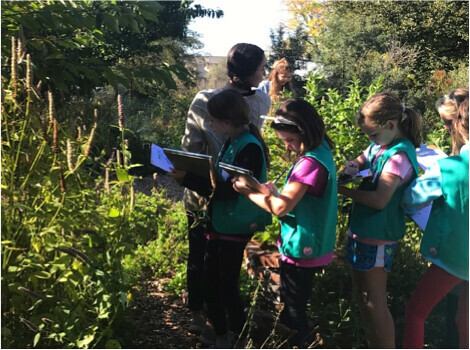 The Girl Scouts were more than impressive—they were tough as they hammered nails into a bird’s home, they were gentle when they passed hissing cockroaches between one another, and they worked together when exploring bee habitats in the garden. Throughout the day, the Girl Scouts carried passports with them that guided their reflection through each station. These passports highlighted quotes and photos from graduate students in hopes of reminding the Scouts that being a scientist is an achievable goal, and many of us started down this path because of events like this when we were their age. For the TLS team, we were filled with fond memories of our paths to pursuing life science; from climbing trees and spending hours at the zoo to being a part of the Girl Scout organization ourselves! After the station rotations, we came back together to brainstorm some daily and community activities that the Scouts can do to protect and promote animal habitats. Planting wildflowers, starting a community compost, and having a bake sale to raise money for endangered habitats are just some of the ideas they came up with. Everyone can engage in these activities, many of which can be done from our own backyards (see station information below). Needless to say, the Girl Scouts earned their badges and hopefully had some fun along the way! For all of us at TLS, this event meant more than gaining a badge. We had the opportunity to give the Girl Scouts a glimpse into a scientific future. Many of us were taken back to what inspired us to follow these career paths, and we realized that this was our chance to pay it forward. We don’t do outreach for credit, we don’t do it for our resumes, we do it because we enjoy it, and we learn from it as well! It was a reminder to look at the world with wonder, to not take the little things for granted, and to appreciate the beauty of learning something new. We were once these Girl Scouts climbing trees and searching for what interested us, and hopefully someday they will be in our shoes pursuing a career that involves their passions. 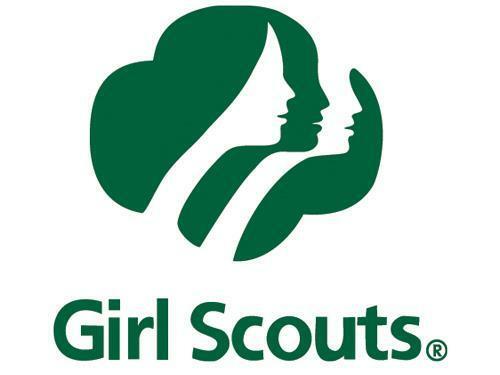 Read on for more about what the girl scouts went through to earn their stripes. If you are interested in participating in an event such as this in the future, please contact us at tlsoutreachandcommn at gmail dot com for more information. Cutting down trees for land development may cause trouble for many bird species in your neighborhood this year as they look for places to build their nests and lay eggs. 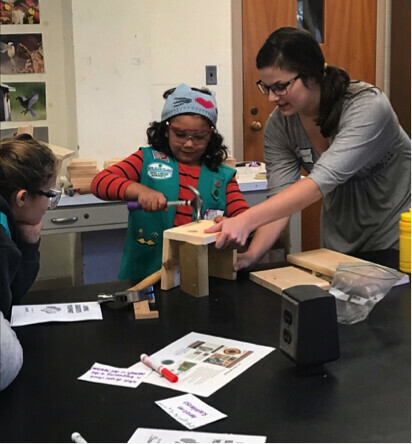 At the “Nest Box Station,” Girl Scouts learned about a solution to give birds a safe space to nest in their neighborhoods. A good nest box should keep birds dry in the rain and safe from predators. The size, type, and placement of the nest box are also important things to consider. For example, you may want to place it high enough that neighborhood cats won’t be able to jump up! 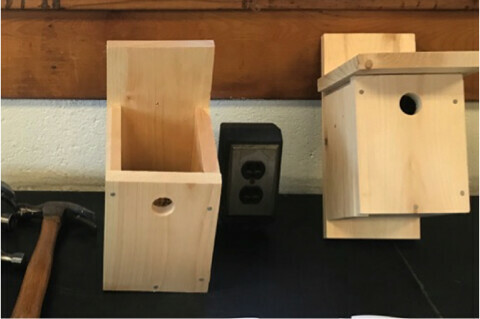 The Girl Scouts built nest boxes perfect for House Wrens or Black-capped Chickadees. Check NestWatch.org and AllAboutBirds.org for more information about local bird species and plans for building other types nest boxes at home. 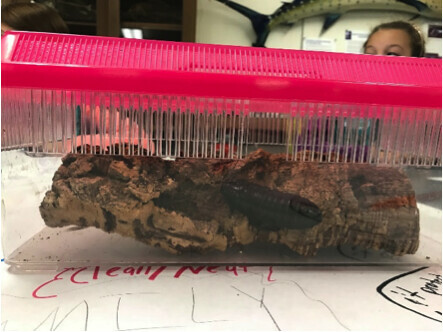 At this station, Girl Scouts learned about the behaviors and habitats of two small but important critters that are not typically well received. In Madagascar, hissing cockroaches play an important ecological role as detritivores, eating organic waste and decaying material often found on forests floors. Many of the Girl Scouts were already knowledgeable about insects and showed courage handling the cockroaches. The next animal introduced was the amblypygid, found in tropical regions like Ecuador . Everyone learned about the amazing navigational ability amblypygids use to find their ideal habitat, some able to find their way back home after being displaced almost 30 feet . By the end of the day, the Girl Scouts learned that small animals that we rarely see can play important ecological roles and aren’t as creepy and crawly as we usually think. Wiegmann, Daniel D., Eileen A. Hebets, Wulfila Gronenberg, Jacob M. Graving, and Verner P. Bingman. Amblypygids: Model Organisms for the Study of Arthropod Navigation Mechanisms in Complex Environments? Frontiers in behavioral neuroscience 10 (2016). Hebets, Eileen A., Eben J. Gering, Verner P. Bingman, and Daniel D. Wiegmann. “Nocturnal homing in the tropical amblypygid Phrynus pseudoparvulus (Class Arachnida, Order Amblypygi).” Animal cognition 17, no. 4 (2014): 1013-1018. « Grad Students Meet Girl Scouts Part 2: Conserving Local Bee Habitats, One Person at a Time!